Click the button below to add the Viracid (60caps) to your wish list. Viracid includes a powerful combination of key nutrients and botanical extracts that provide support for immune challenges. Viracid boosts immune defenses by providing nutrients such as L-lysine vitamins A and C, pantothenic acid, B12, and zinc. Viracid includes the synergistic blend of botanical extracts black elderberry, astragalus, echinacea, and andrographis, all of which have been used traditionally for their clinically effective immune- modulating properties. 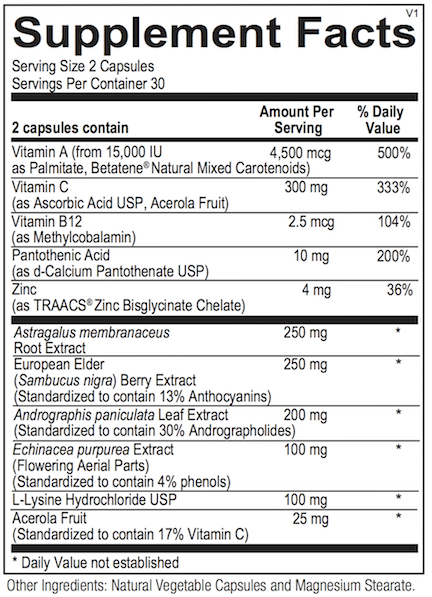 Directions† For immediate immune support: 1-2 capsules per hour or as recommended by your health care professional. Do not exceed 2 capsules every hour. Does Not Contain Gluten, yeast, artificial colors and flavors. Cautions Vitamin A is fat-soluble, and can accumulate to potentially harmful levels over time. Do not exceed recommended dosage. Consult your physician before use. Do not consume this product if you are pregnant or nursing.